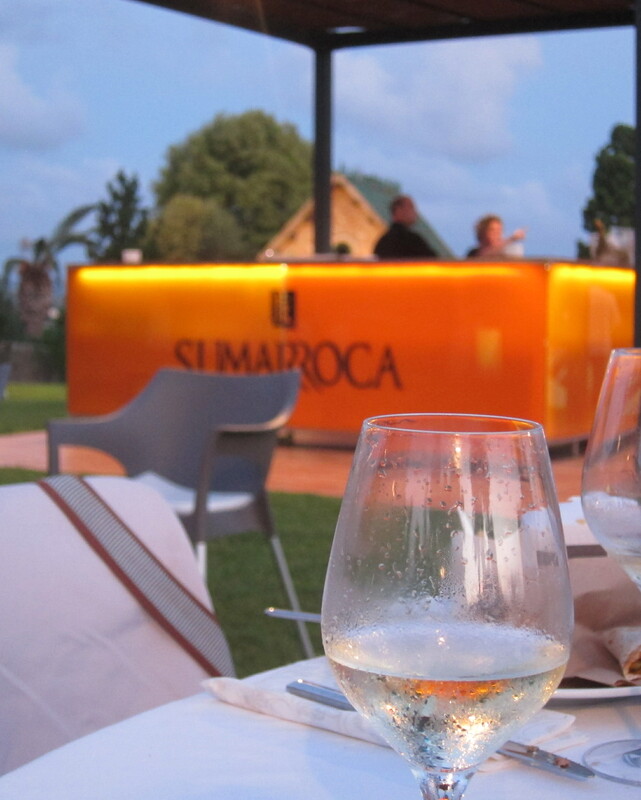 Some of the Wine Pleasures team recently had the, ahem, pleasure of taking a tour of the Sumarroca winery cellars, tasting room, vineyards and more one beautiful day in Spain’s Penedès wine region. It was an absolutely fantastic experience, made more so by the enthusiasm and warm friendliness of Carles Sumarroca, his wife Nuria Claverol and the General Manager Josep Puig Subirana. 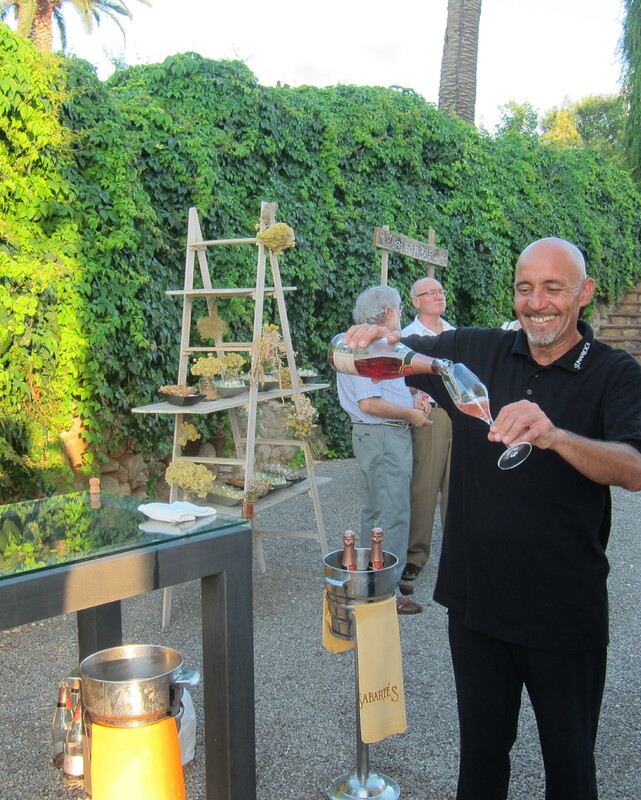 We tasted an absolutely delicious cava which will be featured in the 50 Great Cavas 2016 book, and were invited to a special event at their chateau, the Heretat Sabartes Estate. We arrived the next evening, finding our way around lots of roundabouts with a less than cooperative GPS, and pulled up to the impressive 19th century modernist mansion. In the words of Josep, “Es otro mundo”, and it truly is like another world. We arrived at about 8 in the evening, a lovely time to see the sun streaming through the branches of the enormous tree in the center of the driveway approaching the mansion. Near the entrance to the estate, there is a stand alone building used as a space for performances, with seating and a stage set up for the music later in the evening. The estate has 25 hectares of vineyards, where Muscat, Chardonnay, Sauvignon Blanc and Riesling are absolutely thriving in the chalky soil typical of the Baix Penedès. 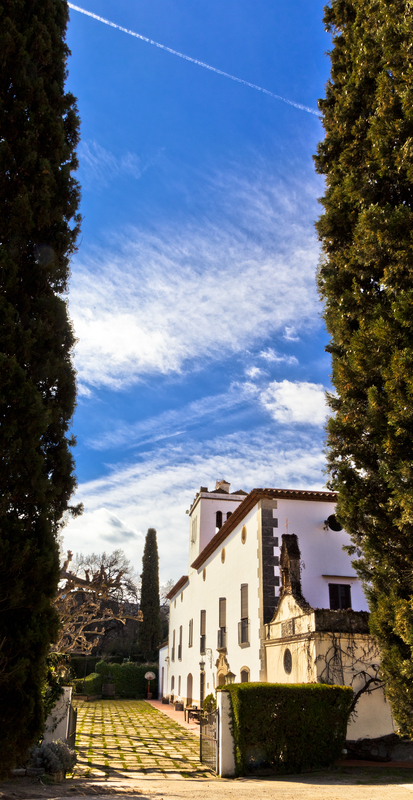 The lawns around the mansion are beautifully manicured, and we are greeted with glasses of Cava Rosado immediately. 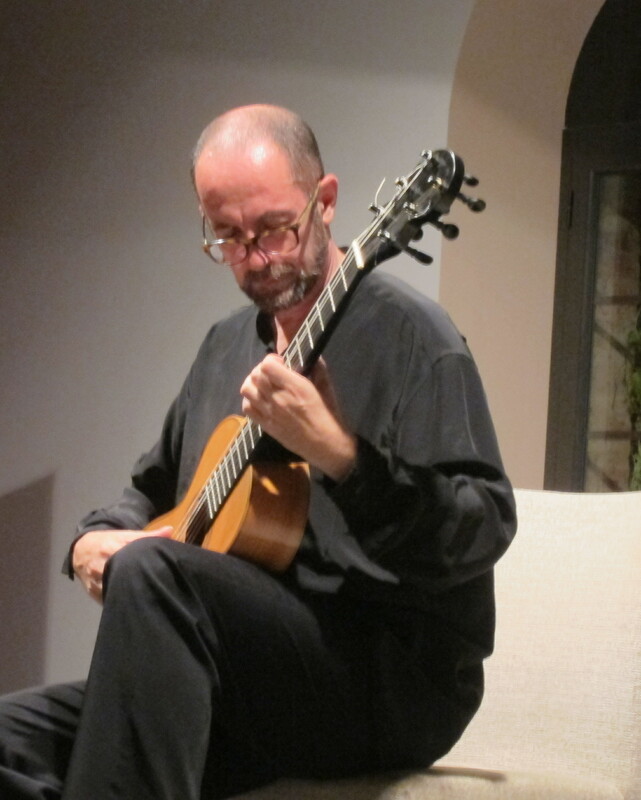 Many guests have arrived already for the event, an evening of gastronomic delights, wine and a musical performance by a very talented Catalan guitarist, Xavier Coll. 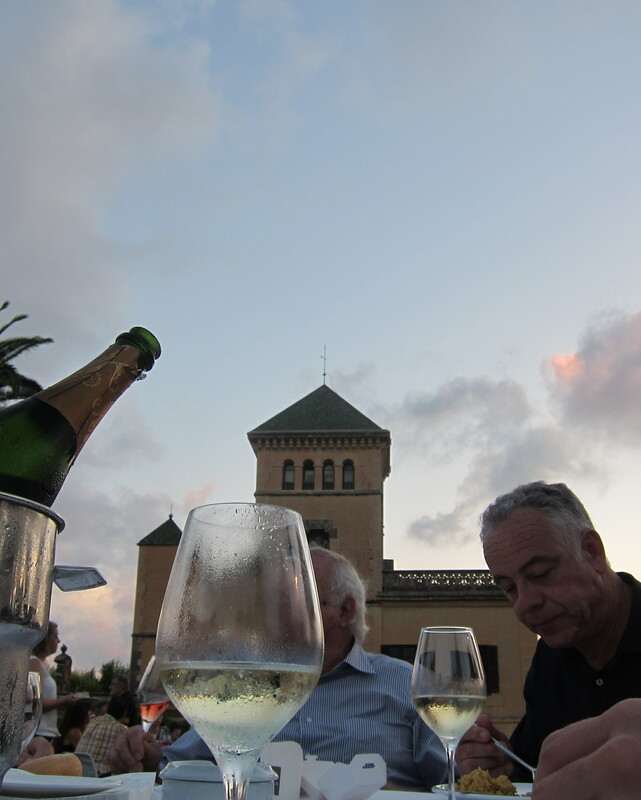 We walk with our glasses of delicate and refreshing cava, and meet Josep on a grassy knoll to the left of the mansion. Just beyond is a large bar set up with many tables around it for open-air dining. Josep gives us a tour of much of the estate, including large rooms with beautiful floral arrangements, furnishings, tables set with pristine linens and stemware and enormous floor to ceiling windows with views of the vineyards surrounding the estate. It is in these rooms that many events and even weddings have been hosted. 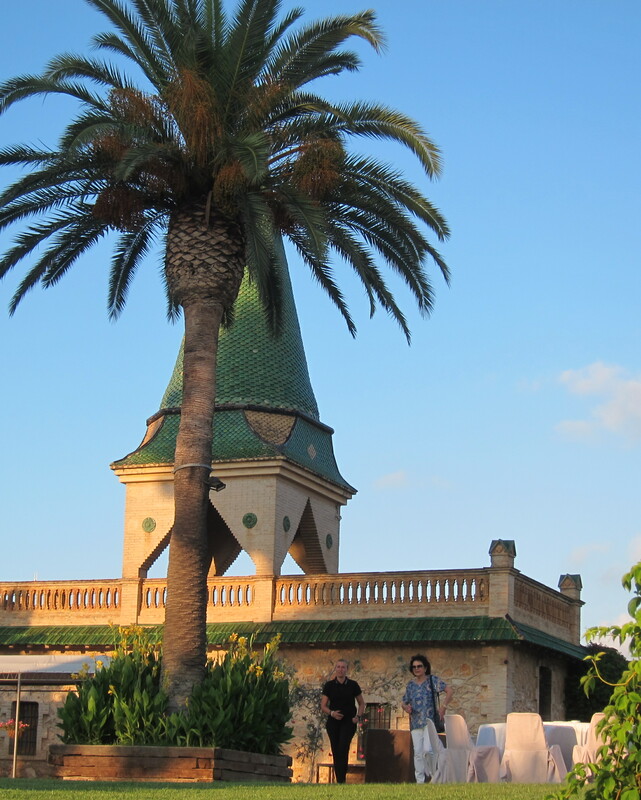 We explored the estate, enjoyed glasses of cava and the tasty appetizers. It was soon time for dinner and all the smiling guests began to head for the grassy hill where beautiful large, round tables were set. It was a social kind of dinner, each table was set for eight, so we had the opportunity to eat and mingle with some new faces and enjoy our meal with Josep. It was beginning to get dark now, and we headed to the bar to try more wines. Their Temps de Flors was absolutely lovely, delicate, floral. It is a blend mainly of Xarel-lo combined with the sweet and elegant aromas of Muscat and Gewurtzraminer, which are international grapes that are grown in their own vineyards. Dinner was an absolute delight. We didn’t know what to expect. I personally expected something perhaps a little more traditional from an estate such as this, which boasts such timeless beauty. 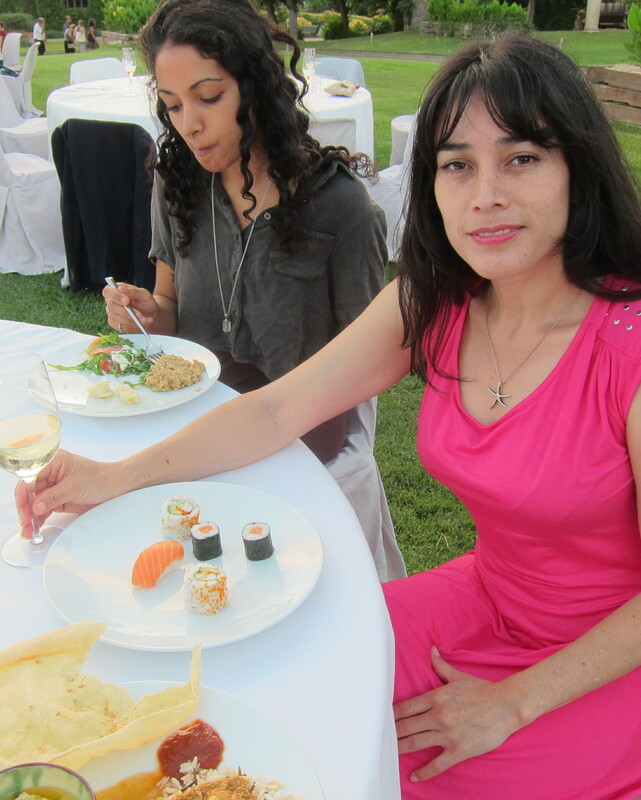 Instead we saw many different tables set up with food all around the perimeter of the grassy seating area on the lush lawn. Each table represented food from a different part of the world. The mushroom risotto and caprese salad from the Italian table were absolutely mouth-watering. The sushi was fantastic, including red tuna nigiri, salmon sashimi and much more. Lamb kebabs and humus awaited in a Middle Eastern themed table. Omelettes with prawns, cheeses and crackers were on offer at a French inspired table. Fajitas with guacamole and tortilla chips on a Mexican inspired table. Small steak burgers grilled right before your eyes and topped with cheese and caramelized onion were a great surprise at what I guess is an American table, complete with French fries and ketchup. When we first sat down we went to the bar at the epicenter of all these tables and ordered a glass of wine each. Later someone came to bring us bottles for the table. We were so impressed, and I personally felt completely spoiled. The food was truly impressive and all the guests were having a fantastic time. The energy of the night was infectious, everyone was well fed and had all the wine you could possibly ask for, smiles and laughter abound. As darkness spread and the stars began to come out for the evening, all the guests finished with their dinners and were led to the performance hall near the entrance of the estate. There was a small stage set up and we were lucky enough to snag seats right at the front. Four acoustic instruments were set up, a traditional guitar and three other string instruments bearing similarities to the guitar, some with more strings, all different sizes. Xavier Coll came out and played hauntingly beautiful music with each instrument, that had the room shrouded in silence as all the guests watched on with bated breath. He played three songs with the traditional guitar. All the songs so far had been only guitar music, but with the final song he demonstrated his very powerful and moving voice. The entire crowd was stirred by this show of talent and he received a standing ovation. It was truly an unforgettable evening, and far exceeded my expectations. If you have the chance to experience this, we highly recommend this to anyone with an appreciation for fine foods and wine, a healthy appetite and an ear for traditional music.